2016 has been the 50th anniversary of the founding of our company. This has been a great reason to revisit our history, much of which we have in scrapbooks (actually bound book proofs with blank pages of their earliest publications) dating back to the 1960s. This article is from 1973 and is particularly interesting as it features the founders of New Zealand Fine Prints Don & Enid Ellis, discussing how they started in the art publishing business with Christchurch reporter David Young. A note on the name change - in the 1990s the publishing and mail order businesses of Avon Fine Prints and Capper Press were merged into a single company around the time we shifted focus to publishing and online retail when our catalogues went online at prints.co.nz). 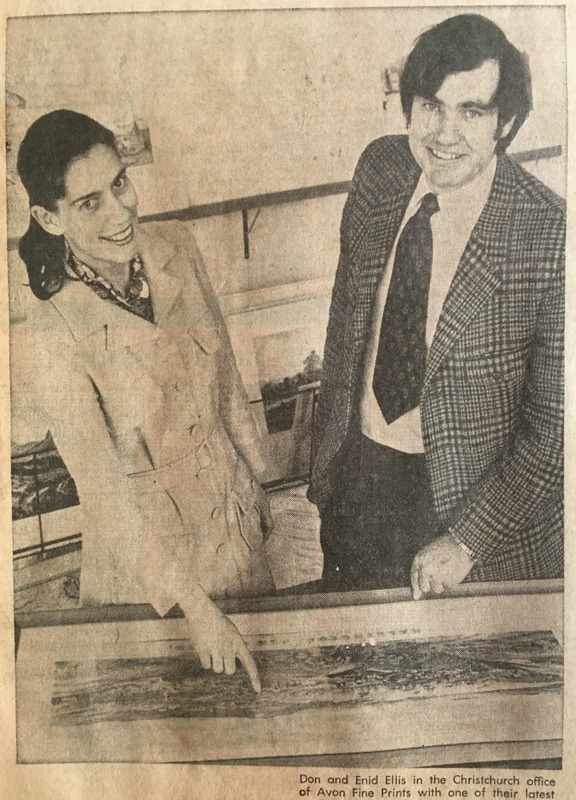 The Queen, the Pope, President Nixon, Emperor Hirohito and Mr Trudeau are among the recipients of the work of a Christchurch company, Avon Fine Prints Ltd.
One of Avon’s more monumental achievements, Cook’s Artists, a collection of the drawings and paintings done by men on Cook’s voyages, became the official New Zealand Government book for 1969. That year was the tricentenary of Cook’s discovery of New Zealand and the book went to official recipients and private collectors all round the world. Both aged about 30, the couple have for the last seven years been publishing reproductions of early New Zealand paintings and prints as well as facsimiles of fine, historical books. Publishing, not printing, is their line, their speciality being limited, hand-numbered prints of scenes which, while not common, are not unfamiliar sights on carefully decorated walls. “We are a pirate outfit really,” said Mr Ellis when I telephoned to ask about his operation. But in a personal interview, this same candour revealed that his and his wife’s interest in New Zealand nineteenth century art is considerable. The couple have an extensive personal collection and it was Mr Ellis’s father’s knowledge of the subject which really led to the establishment of the present business. Returning from Australia in the early 1960s with a bundle of New Zealand paintings by such artists as Hoyte, Gully and Lindauer - all purchased for about £30 and resold here for considerably more - Mr Ellis jun. went hunting for similar material round the world. His best deal, he says, was a Lindauer which he bought for £20 and sold for £900 - the then top price for a New Zealand painting. But while the market knew no bounds, the supply of material was distinctly limited. 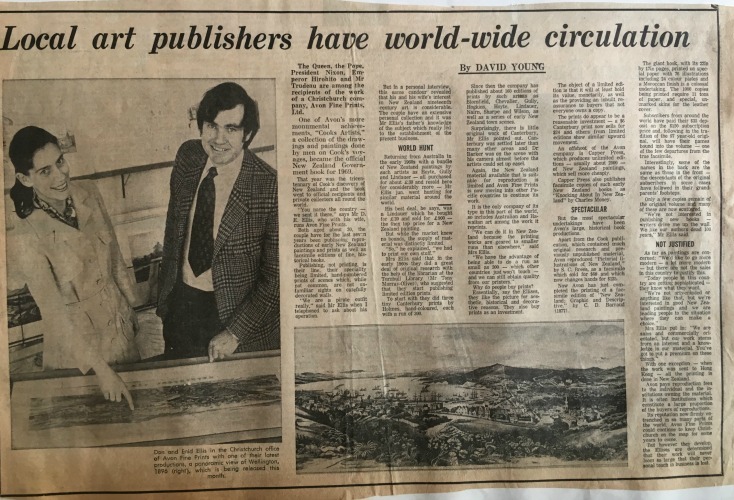 Mrs Ellis said that in the early 1960s they did a great deal of original research with the help of the librarian at the Alexander Turnbull Library (Mr Tony Murray-Oliver), who suggested that they start publishing limited edition prints. To start with they did three tiny Canterbury prints by Holmes, hand-coloured, each with a run of 300. Since then the company has published about 160 editions of prints by artists such as Blomfield, Chevalier, Gully, Hodgkins, Hoyte, Lindauer, Nairn, Sharpe and Wilson, as well as a series of early New Zealand town scenes. Surprisingly, there is little original work of Canterbury, Mr Ellis pointed out. Canterbury was settled later than many other areas and Dr Barker was on the scene with his camera almost before the artists could set up easel. Again, the New Zealand material that is suitable for reproduction is limited and Avon Fine Prints is now moving into other Pacific countries to continue its work. It is the only company of its type in this part of the world, so includes Australian and Hawaiian art among the work it reproduces. “We can do it in New Zealand because the printing works are geared to smaller runs than elsewhere”, said Mrs Ellis. Why do people buy prints? Essentially, say the Ellises, they like the picture for aesthetic, historical and decorative reasons. They also buy prints as an investment. The object of a limited edition is that it will at least hold its value, monetarily, as well as providing an inbuilt reassurance to buyers that not everyone owns a copy. The prints do appear to be a reasonable investment - a $6 Canterbury print now sells for $24 and others from limited editions show similar upward movement. An offshoot of the Avon company is Capper Press, which produces unlimited editions - usually about 2000 - of New Zealand paintings, which sell more cheaply. Capper Press also publishes facsimile copies of such early New Zealand books as Knocking about in New Zealand by Charles Money. But the most spectacular undertakings have been Avon’s large, historical book productions. Apart from the Cook publication, which contained much original research and previously unpublished material, Avon reproduced Pictorial Illustrations of New Zealand, by S.C. Brees, as a facsimile which sold for $60 and which now changes hands for $125. Now Avon has just completed the printing of a facsimile edition of New Zealand: Graphic and Descriptive by C.D. Barraud (1877). The giant book, with its 22in by 17in pages, printed on special paper with 76 illustrations including 24 colour plates and a Moroccan finish is a colossal undertaking. The 1000 copies being printed require 11 tons of paper, and special, unmarked skins for the leather cover. Subscribers from around the world have paid their $35 deposit on the $150 subscription price and, following in the tradition of the 97 year-old original, will have their names bound into the volume - one of the few departures from the true facsimile. Interestingly, some of the names in the back are the same as the ones in the front - the descendants of the original subscribers in some cases have followed in their grandparents’ footsteps. Only a few copies remain of the original volume and many of these are now scattered. “We’re not interested in publishing new books - writers drive me up the wall. We like our authors dead 100 years,” Mr Ellis said. As far as paintings are concerned: “We’d like to go more modern - a lot more modern - but there are not the sales in this country to justify this. “Today people in this country are getting sophisticated - they know what they want. With one exception - when the work was sent to Hong Kong - all the printing is done in New Zealand. Avon pays reproduction fees to the individual and the institution owning the material. It is often institutions which constitute a large proportion of the buyers of reproductions. Its reputation now firmly entrenched in so many parts of the world, Avon Fine Prints could continue to keep Christchurch on the map for some years to come. But however they develop, the Ellises are determined that their work will never loom so large that their personal touch in business is lost.